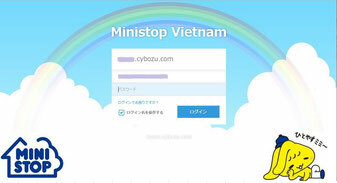 Company name: MINISTOP VIETNAM.CO., LTD. The convenience stores have become widespread in Vietnamese nowadays. 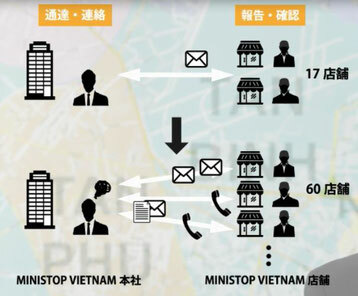 In Vietnam’s highly competitive marketplace of convenience stores, the cutthroat competition is happening below the surface, which leads to the fact that MINISTOP VIETNAM CO., LTD. (the following: MINISTOP VIETNAM) reorganize Vietnam market. MINISTOP has achieved an advance to Vietnam’s market with the local company as the joint venture in 2011, but the opening stores are not as advanced as expected. Thus, MINISTOP cancelled the franchise agreement with the local company in February, 2015. From April 2015, the company has been newly in partnership with Sojitz Corporation and after the restart of MINISTOP VIETNAM as the convenience store operating company, they become to expand with the unprecedented sense of speed. 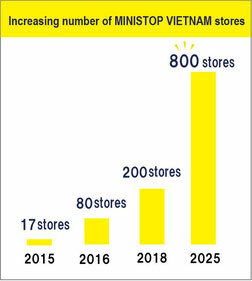 In 2025, MINISTOP VIETNAM is going to develop the number of the stores to more than 40 times as many stores as the point of the restart (at April, 2015). To approach MINISTOP VIETNAM as one of the most powerful branch in the competition of Vietnam’s convenience stores, we interviewed Mr. Maeda CEO of MINISTOP VIETNAM and Mr. Onoda, Assistant Senior General Manager. Into MINISTOP stores in Ho Chi Minh City, Vietnam, the lights in the store are bright, the cleanineaches every corner, the commodity display shelf and the correspondence of the staff are just like the convenience stores in Japan. Customers gather at the wider eat-in corner, the atmosphere in the shop is clear. MINISTOP Vietnam is developing stores in convenience stores in Vietnam based on the Combo-Store concept with eat-in as well as store development in Japan. In MINISTOP stores, they handle about 2,000 kinds of products, including local bread and confectionery, vegetables / fresh foods, imported goods from Japan and other countries. In the box lunch section, there are a lot of rice - recently popular in Vietnam, not to mention Vietnamese local food. A fashionable menu signboard is placed over the cash register like a fast food shop, and you can order Halo Halo, soft ice cream, fried chicken etc., which are very popular in Japan. 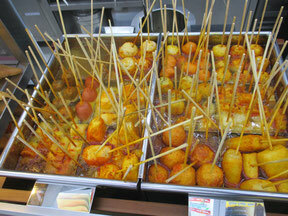 Among them, melon soft ice cream and Oden are highly concentrated on. Melon soft ice cream is not too sweet and has an elegant taste. 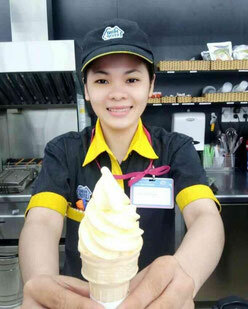 The price is 8,000 Viet Nam Dong (about 36 yen) and you can get a high-grade fruit soft ice cream. Although it gained popularity in Japan, it is extremely popular throughout the year in high temperature in Vietnam. In addition, oden differs its taste in different seasoning from those sold in Japan, and its soup is unique to Vietnam with acidity and pungent taste. There are also many kinds of ingredients suitable for local tastes such as taro balls and salmon balls, as well as some standard items such as fried tofu and kneaded materials for popular Japanese oden. 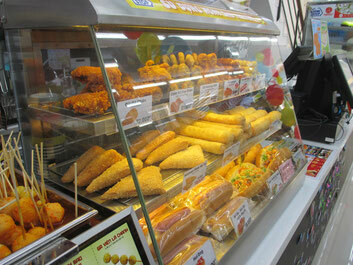 In the show-case next to the cash register, in addition to the fried chicken and the Frankfurt which are popular in Japan, bánh mì (Vietnamese sandwiches using French bread) are lined up, which is a traditional soul food of Vietnam. They say they pursued delicious food by cooking and finishing in the shop and offering it to customers. Thus, MINISTOP VIETNAM has taken advantage of the locally preferred flavoring and cooking laws, has developed business in Vietnam, has gained popularity and gained support from local customers. It's their challenge again in Vietnam where convenience stores of foreign or local capital are crowded. Their start has been going well, and the inside of the store became much cleaner than before the restart and in-store cooking of fast-food and eat-in corner are best-selling items. New MINISTOP VIETNAM, departing at 17 stores in 2015, expanded to 61 stores in September 2016.
such as inventory information and sales reports from each store. In the convenience store business that develops multiple stores, there are the reports from each store to the headquarters and the message; informative matter from the head office to the stores daily. We used to contact each other by email and phone, interaction occurring daily, for example notice from the headquarters to the store, daily reports reported from the store to the head office, even quarterly commodity inventory reporting. Depending on such circumstances, the headquarters had worked to consolidate and analyze the data, such information arrives everyday from dozens of stores. Work was troublesome and time consuming due to omission of shops and mail confirmation, they said it took time to find information back in the past e-mails. The accumulation of know-how of store management was one of the tasks. For example, when the store manager is changed, the store operation and atmosphere change, often leading to increased sales, but in order to expand this know-how horizontally it is necessary to collect information from each store first. In addition, events frequently occur in stores, such as store facilities such as equipment breakdowns and leaks, and customer had troubles within the store, such as speedy supporting of headquarters. It was a challenge to how to accumulate countermeasures against such events that can occur in common for all stores and how to deploy them to each store. Therefore, they decided to introduce kintone which is cloud type and can realize construction in a short period at low cost. 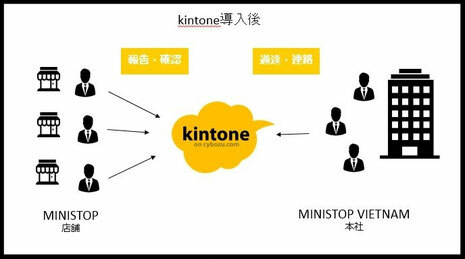 "Currently, we are mainly using it for communication between shops and headquarters but we are planning to enrich the functions in the head office departments in the future, the settlement seems to be able to use the process management of kintone, and I realize the possibility of various uses such as accumulation of know-how in each department. 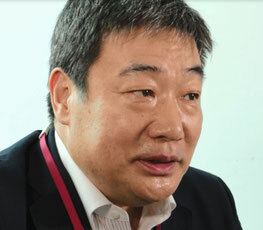 "(Mr. Onoda) In the future we plan to increase store opening in franchise-style as well as in Japan. 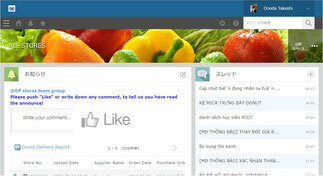 They expect greatly kintone for efficiency in interaction with franchise owners. MINISTOP VIETNAM expands the number of stores to 80 stores by the end of 2016 and aims to expand to 200 stores by 2018. 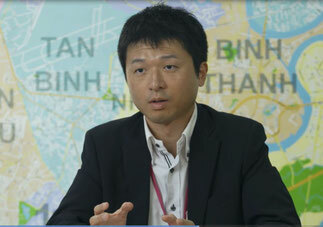 They intend to accelerate store development intensively in Ho Chi Minh City. "MINISTOP VIETNAM," under the mission of" realizing a society full of smile with deliciousness, convenience and coolness " we will improve our QSC level of the store (Q = Quality, S = Service, C =Cleanness") and pursue customer satisfaction. "(Mr. Maeda). There will be no doubt that the convenience market will expand in Vietnam where further economic growth can be expected. MINISTOP VIETNAM's challenge has just begun. There would be no doubt that the convenience market will expand in Vietnam where further economic growth can be expected. MINISTOP VIETNAM 's challenge has just begun.